An Adobe product manager has pointed to the fact that Apple had refused to support Flash on iOS as a major reason for the company's decision to halt development of the Flash Player for mobile devices. Mike Chambers, Principal Product Manager for developer relations for the Flash Platform, published a blog post clarifying the reasons behind the software maker's plans, which were announced on Wednesday. Adobe said it will continue to support existing implementations of Flash Player for mobile browsers, but will cease development in order to redirect resources to better focus on HTML5. Chambers has spent the past 12 or 13 years working with the technology as part of the Flash community. According to him, the past couple days "have been some of the most difficult" of his career. "Considering how politically charged the issue has been, the decision to stop development of the Flash Player for Mobile Browsers was not an easy decision. However, at the end of the day, there were a number of items that made it clear that putting resources towards its continued development would not be the best use of resources," he wrote. The first reason Chambers cited was the fact that Flash Player would never "achieve the same ubiquity" on mobile devices as it has on the desktop. "This one should be pretty apparent, but given the fragmentation of the mobile market, and the fact that one of the leading mobile platforms (Apples iOS) was not going to allow the Flash Player in the browser, the Flash Player was not on track to reach anywhere near the ubiquity of the Flash Player on desktops," Chambers said. Chambers admitted that it is "very clear" that HTML5 is now the solution for providing "a richer browser based experience" across browsers on mobile devices. "No matter what we did, the Flash Player was not going to be available on Apples iOS anytime in the foreseeable future," he said. The ubiquity of HTML5 on mobile browsers was cited as a second reason for Adobe's decision. He pointed to dramatic improvement of Canvas performance between iOS 4 and 5 as an example. Adobe had sought to reach the same level of ubiquity as HTML5, but Chambers said it was "something that did not, and was not going to happen." "This new generation of smart phones and tablets (ushered in by the original Apple iPhone) are only a couple of years old. Because of this, the rendering engines deployed on these devices (most WebKit based) were all also relatively new and modern," he said. Apple's App Store was also partly to blame for mobile Flash's demise, according to the post, as mobile users are much more likely to look to applications than the web for rich content. Chambers cited differences in screen sizes, resolution and interaction models; slower and higher latency network connections; tight integration between apps and operating systems and tight integration between mobile app stores and operating systems as the reasons. "The mobile platforms make it very easy to discover new content and applications by providing tight integration between the app stores (Apple App Store, Android Marketplace, etc..) and the mobile operating system, he said. "In general, users do not look to the web on mobile devices for finding and consuming rich content (such as games and applications)." Chambers also admitted that Flash Player for mobile browsers had required "much more resources" than originally anticipated. Whereas Adobe can usually work within "well defined plugin APIs" on the desktop, the company found it had to work with numerous mobile operating system vendors, hardware device manufacturers and component manufacturers in order to develop mobile Flash. "For each new device, browser and operating system released, the resources required to develop, test and maintain the Flash Player also increases. This is something that we realized is simply not scalable or sustainable," he wrote. Finally, Chambers pointed to the need to shift some resources from Flash to HTML5. Given the widespread adoption of HTML5, Adobe had decided to "more evenly balance" its resources between the two technologies. But, in defense of the product, the manager did remind his audience that "Flash is not dead." He reiterated Adobe's "long term commitment" to Flash Player on desktops. For the "foreseeable future," Adobe will focus on Flash's strengths of delivering "advanced video" and a "graphically rich gaming platform" on the desktop. In fact, Chambers' comments align in part with an open letter on Adobe Flash written by late Apple co-founder Steve Jobs in April 2010. Jobs penned the letter in response to criticism that Apple's decision not to support Flash on the iPhone and iPad was purely a business move. Like Chambers, Jobs pointed to WebKit as an example of the ubiquity of HTML5 on mobile devices. 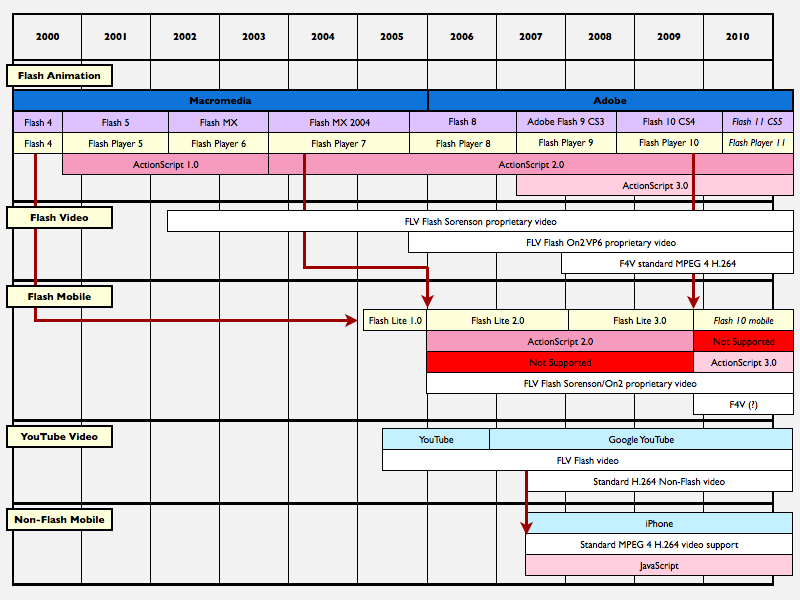 Apple built WebKit off of an open-source project, and it has since been adopted by Google, Palm, Nokia and RIM. He pointed out that, since websites will have to rewrite touch versions of their websites for the mobile age, they might as well just go with the open format. Jobs also used the argument that mobile users often use apps, rather than the web, to access rich content such as games and video. "Flash was created during the PC era  for PCs and mice. Flash is a successful business for Adobe, and we can understand why they want to push it beyond PCs. But the mobile era is about low power devices, touch interfaces and open web standards  all areas where Flash falls short," Jobs said. "New open standards created in the mobile era, such as HTML5, will win on mobile devices (and PCs too). Perhaps Adobe should focus more on creating great HTML5 tools for the future, and less on criticizing Apple for leaving the past behind." Based on Adobe's recent announcement and Chambers' subsequent explanations, it would appear that the company has followed Jobs' advice to give up on mobile Flash and move toward HTML5.